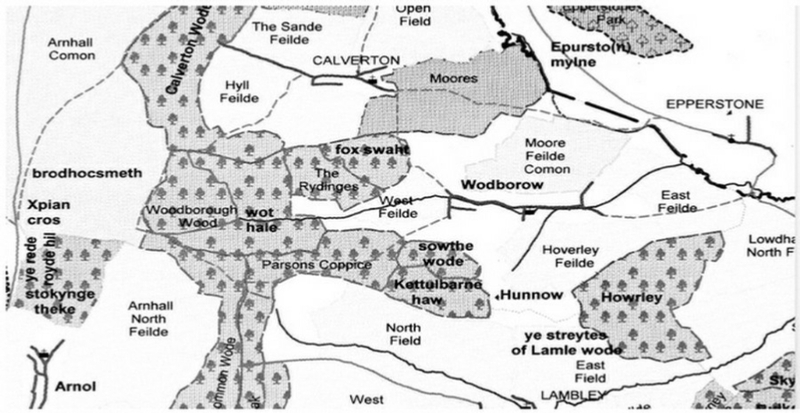 Ploughman Wood (shown on the medieval Sherwood Forest map circa 1400 below as just Howrley; but later recorded as Hoeverly Woode on the 1609 Sherwood Forest Map) is within the neighbouring Parish of Lowdham, and strictly speaking would therefore not normally be part of our research. Our brief is to write and inform only about Woodborough Parish matters, however, this wood so dominates our southern skyline that it seems right for us to include it. (Ed 2002). We thank the Nottinghamshire Wildlife Trust for supplying the following text. For additional information on the Trust try their web site www.nottinghamshirewildlife.org. View of Woodborough from Ploughman Wood. 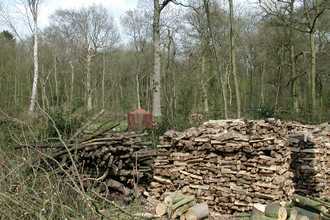 Ploughman Wood was donated to the Nottinghamshire Wildlife Trust by the Home Office in 1996. 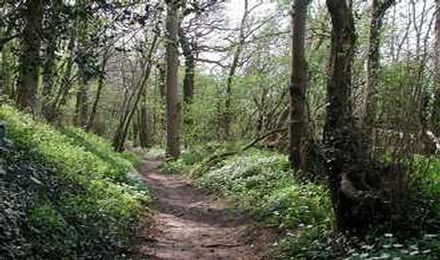 Covering over 32 hectares, this is one of Nottinghamshire’s few remaining ancient woodlands. Documentary evidence shows that it dates back to the 13th century and was part of an area of woodland covering more than 120 hectares. It would have formed part of the south-eastern extremity of the greater Sherwood Forest. This 1400 Medieval map of Sherwood Forest shows the proximity of Howrley to Woodborough. 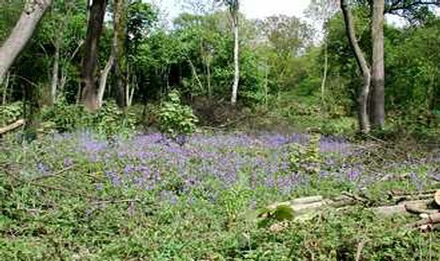 The trees, which are mainly oak and ash with some hazel, holly, field maple and beech, provide an excellent range of habitats for wildlife. Some non-native trees such as Corsican pine, European larch and sycamore will be removed to restore a more natural balance of species. 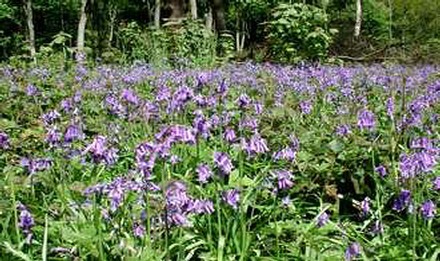 In spring, the wood is carpeted with bluebells. 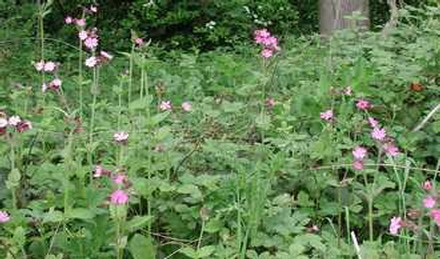 Other plants which are typical and found in this ancient woodland include red campion, yellow archangel, wood anemone and wood melick [a type of grass]. Honeysuckle can also be seen throughout the wood climbing through trees and shrubs. All four photographs below were taken in Spring 2003. The wood contains substantial quantities of dead wood providing an excellent habitat for a wide range of flora, and fauna, including bracket fungi, beetles, bats and hole nesting birds. Over 280 species of invertebrates have been recorded so far. On the south side of the wood, a pond has been excavated and a new meadow area was created in 1998. In time these areas should attract dragonflies, damselflies and other insects. 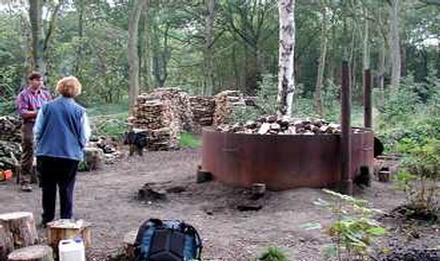 A kiln was installed recently to produce charcoal and this will be sold through local outlets. Below a view of Ploughman Wood taken from Private Road looking over and beyond St Swithun's Church.